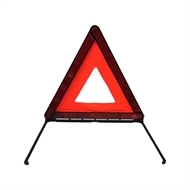 The Brutus Warning Triangle is a reflective red emergency warning triangle which can be quickly set up during a crisis. It features highly visible reflectors with a fluorescent infill. It can be easily stored in its protective case (included).